What is your answer to this question? I say a table can be made of from many things... do you agree? Please be sure to see other tables today via Between Naps on the Porch... perhaps there are other tables that are not EXACTLY tables... and do come back tomorrow... A poodle and I have a little message! Oh yes sweetie, a table is any surface that has something on top of it. Can be a pillow holding a book, even a hammock could be used as a body table it can hold a person, it holds something. Doesn't have to be an actual table with 4 legs. Oh you have woke my mind for the evening. It was supposed to be winding down now. Have a beautiful Christmas FiFi. Thank you so much for being such a wonderful friend. Thank you for your wonderful posts that you share, the wonderful messages that you leave for me. Thank you FiFi for just being YOU. Wishing you and your family a tres joyeux noel. 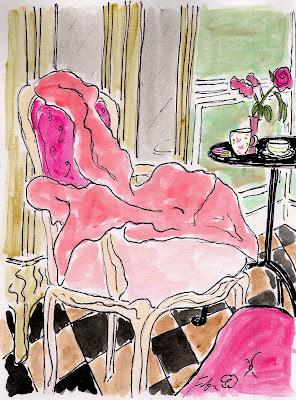 Lovely, lovely pretty paintings as always Fifi! Merry Christmas to you for tomorrow and happy holidays!! Well my Queen... I say yes! It is a table and a CLOTHING RACK! How many times do we use the "CHAIR" as a catch all for those items that we swear we will get to in a minute and never do, until the pile is so high that we are forced to do so:)) your chair painting is BEAUTIFUL!! Lots of PINK-A-LICIOUS colors!! I do agree Miss Fifi! These are gorgeous chairs. I love pink!!! I also love to put things on a chair, a stool, an ottoman. Love the first image. 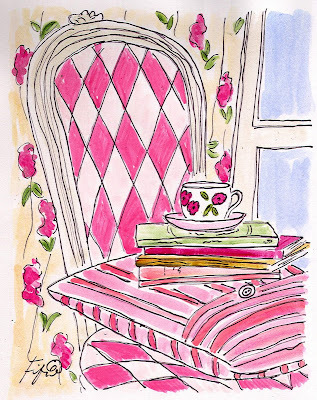 Love the pink and the chairs, beautiful paintings. Beautiful! Always look forward to see what you have painted.